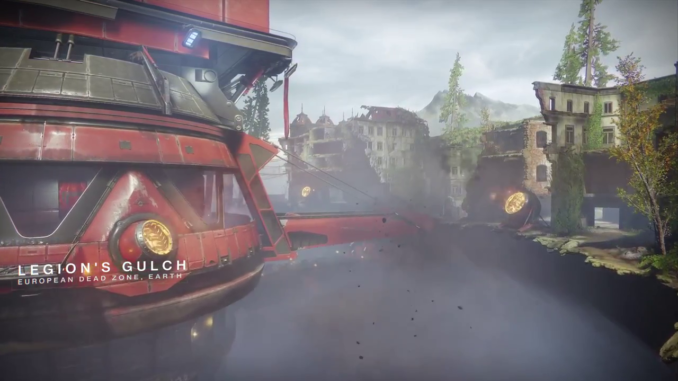 This article contains information about Destiny 2 Legion's Gulch in terms of PvP. It also contains some tips and tricks to battle in said area. Destiny 2 Legion’s Gulch takes place in a wasteland. For the battlefield, the players will fight in a ruined city that’s divided into two parts. In that area, there are also remnants and evidences of Cabal invasion. In the middle of the battlefield, players will spot the Cabal Drill which also has a platform and a bridge. Players will launch off a pad into the battle arena where they will skirmish. As the skirmish continues, players can either position themselves strategically or confront the enemy head on. In Supremacy mode, players are to obtain the crests of the opposing team. The only way to obtain those crests is by killing the members of the other team. However, you can also prevent them from scoring by taking your teammate’s crest should they die. Lying around the area, there are terminals that have Power Ammo for you to use. To win, here are some tips and tricks. Grab the power ammo while you can. It’ll be harder if you’re being chased down. Once you launch from the pad, you’ll end up near the drill. There’s a mid point where you’ll find a stone wall to hide behind. Most of the time, you’ll find most of your skirmishes there. Take an auto-rifle and an SMG with you to deal more damage. Since majority of the battles are close combat, the auto-rifle and the SMG will give you a better chance in surviving the battle. With the many buildings in the area, it’s best to use a grenade to flush out players. However, it’s also good to have a shield. For Titan class, they can shield players from the incoming grenade blasts. Launch pads are where players are the most vulnerable. Players can inflict damage on the enemy before they land.